Salmon and Avocado and Spicy Dynamite in the front. Half eaten Rainbow in the back. Tuna, Yam and California Roll with Brown Rice. 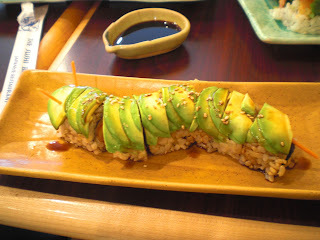 Catepillar Roll with Brown Rice. How cute! Dinner we went for sushi before a movie. 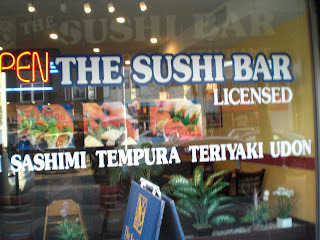 We hit the Sushi bar just west of Burrard on 4th ave. I think it's called the Sushi Bar. It's a couple of doors down from the vegetarian indian place on the south side. It's a fantastic find. Pictures of the front and our food are coming. It is totally neutral on pricing. Though D and his friends that were visiting from San Francisco in February, who went there TWICE, thought the pricing was great for the quality. They have the typical 'special combo' for 6 bucks with miso soup. BUT, you can have it made with brown or white rice which is very atypical for the quickie combo. 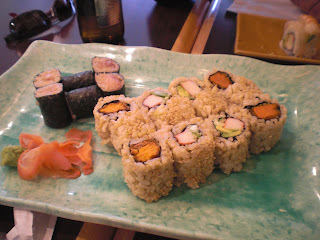 The special comes with a California Roll, Tuna roll (but it was chopped) and Tempura Yam roll, which was great! The miso soup was tasty enough. D got a Rainbow Roll, Salmon n Avocado Roll and a Spicy Dynamite and an Asahi. He wanted a spider but they were out. I also got a Catepiller Roll. It was all very tasty. 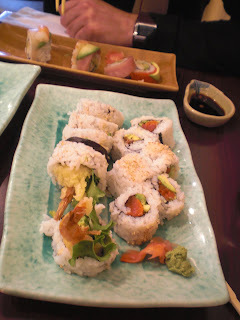 Rainbow Roll is a crab and avocado roll with Ebi, Salmon,, Tuna and Avocado slices on the outside. Very filling and the tuna and salmon was very fresh. The Spicy Dynamite is a typical tempura shrimp, crab and avo roll so getting full, I was going to pass on D's offer of a piece but I took it and I have to say, their tempura is yuuuuuM. Light, crispy. And I INSIST, not all tempura's are made the same. Some tend to be pancakey or dough. A good tempura is air light, crispy and melts in your mouth. The Catepillar Roll was so cute. It's a crab and eel roll served on bbq eel sauce. The outside is covered in thin avocado slices and the roll is pressed into a square mold. The roll was gently pushed into a slight 'S' shape and the top end had two thin carrot splinters for antennae and the back end had one for a tail. It was very yummy. D didn't like the eel sauce too much. It was a bit sweet but bbq eel sauce / ponzu usually is. I really liked the brown rice option. I felt better about all the rice you end up having when you have rolls instead of sashimi which I avoid unless I know know the place because the last thing I want is fishy sashimi. I will definitely go to this place again and again. When we got in late. I had a dessert craving. D made me Gooey Lava Chocolate cakes. I'll have to get the recipie. 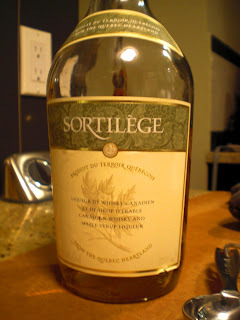 In honour of the Food Fight movie we saw promoting organic food and small farmers D made it with, Free Range Organic eggs, Green and Black organic chocolate, and Quebecois Terroir Maple liqueur..... Oh and mint from his balcony. Makes 6. You can refridgerate unbaked ones wrapped in cling film for later. Upto a week. Butter and lightly flour 6 (6-ounce) ramekins. Tap out any excess flour. In a small saucepan, bring to a boil 2 inches of water. 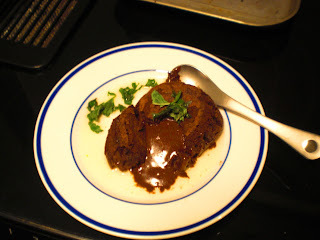 In a large glass bowl, add butter, chocolate and espresso powder. Lower heat and place bowl over the simmering water. Slowly whisk mixture until the chocolate is almost completely melted. Remove bowl from heat and continue to whisk until all chocolate has melted. Allow to cool slightly. In a large bowl, add eggs, yolks, and sugar. Using an electric mixer, beat until light and fluffy (you'll notice the change from a Bigbird yellow to a mayonaisse colour) and pale in color. Reduce speed to medium-low and slowly pour in the chocolate mixture. Add the flour and mix until just combined. Do not overwork the batter. Divide the batter between the molds. Line a baking sheet with parchment paper. Place chocolate molds onto baking sheet and place in oven for 7 minutes. If not baking immediately, cover chocolate molds with plastic wrap and refrigerate until ready to serve, up to 8 hours. When ready to bake, place refrigerated chocolate molds onto baking sheet and place in oven for 10 minutes. The top and sides should be cooked and dry and the inside will be runny. Using oven mitts, carefully invert each mold onto a plate and let it sit for 10 seconds. Then lift 1 corner of the ramekin and the cake should slip out. Sprinkle about 1/2 teaspoon your favourite liqueur over each cake (Frangelico, Kaluha, Maple). Spoon berries if you have them. We didn't and garnish with mint. Serve warm. Chef's Note: Tried. Fantastic and easy. Make sure ramekins are well floured to avoid cakes from falling apart when unmolding.